Tom Heaton has recognised the contribution of goalkeeping coach Billy Mercer as the Clarets club captain maintained his unbeaten run since returning to action. Following a 15-month absence from any Premier League activity, the 32-year-old replaced Joe Hart when West Ham visited Turf Moor last month. The former Cardiff City and Bristol City stopper, who kept his first clean sheet in 20 months against Manuel Pellegrini’s Hammers, went on to retain his place in victories over Huddersfield Town and Fulham. Heaton understands that his mentor has a relatively obscure role on his hands, with five keepers under his wing, but Mercer has continued to have a positive influence on his career in his sixth season at the club. “It is a tough role, especially at the minute with five goalkeepers,” Heaton said. “It is a difficult role and he is obviously staying on top of it and trying to manage it. “The manager makes the decision for the team which really is the be all and end all, everything else is secondary to that. “But he (Billy) does a good job of managing that. 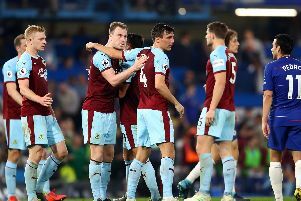 Three wins in succession has put the Clarets hot on the heels of Crystal Palace while the likes of Brighton and Hove Albion and AFC Bournemouth are also in their sights in mid-table. And Heaton confirmed that the squad is now determined to keep moving things forward having come back from a goal down to win two games on the bounce. He said: “They have shown a lot of character, especially considering how the season has panned out so far. “We have had some difficult moments, there is no two ways about it and we have been in difficult positions so to show that character in two what people dub ‘relegation games’ in Huddersfield away and today to show that character and come back from a goal down, a lot of credit can be given there. “It feels great; the West Ham game gave us a real platform and we took that into the Huddersfield game. “Again we went one behind which was difficult away from home. “But you build with those, it was a good first result, a good second result, the lads backed it up with a good FA Cup win in difficult circumstances. “And then today we went a goal behind to an incredible goal in fairness to him. “It was a brilliant touch and a great finish, it was difficult conditions and we rallied well so we can take a bit of momentum from that. “Again, no-one is getting carried away.